Have you ever felt like you need multiple pieces of equipment when it comes to stretching, strengthening and stabilizing muscles? Posture Medic is the all-in-one tool, conveniently designed to overcome poor postural habits, and is easily transformed into a stretching and strengthening device. The Posture Medic has been designed to improve the strength and range of motion of the upper body. You can only make postural adjustments when you are aware of the poor alignment. The Posture Medic provides the extrinsic feedback as a reminder of where your body is in space (proprioceptive awareness). These reminders can lead to improved posture through the retraining of muscles that have become lazy. As a boxer, my posture has become unfavourable for everyday life. I require a conscious thought to activate the muscles accordingly to allow the preferred anatomical positioning. Most people could benefit from the Posture Medic. In my case, the postural adjustments have been impacted by my chosen sport, as with most martial arts, we roll the shoulder forward to assist in guarding of the jaw. Although, prior to sustaining shoulder injuries, I was blissfully unaware of this poor postural positioning day in and day out. After sustaining a shoulder injury I was loaded with strengthening exercises and stretches to aid my recovery. This included retraining various minor muscle groups to activate, allowing those muscles to initiate a movement. Wearing the Posture Medic three times daily, for twenty minutes at a time, gave me the opportunity to complete all the physiotherapy exercises I have (I have a lot), breaking it down into smaller chunks, with no leverage to use the excuse that I don’t have an hour to complete them. After each use, I would do three sets of two stretches or strength exercises and then continue with my day. I found this product to be extremely beneficial to my exercise program, which was provided by my physiotherapist. Therefore, I did not follow the program provided with the Posture Medic, and so I utilised a case study to provide further insight. Hayley, a university student, (thank you for participating) is a very active individual, however also spends up to 10 hours a day standing with her jobs as a bar tender and retail assistant. Moreover, she can spend up to five hours at a time in front of her computer. She struggles with poor posture, and experiences pain through her back, traps and shoulders during those long hours. She used the Posture Medic five to six times a day and followed the program, included in the product, religiously at the start. 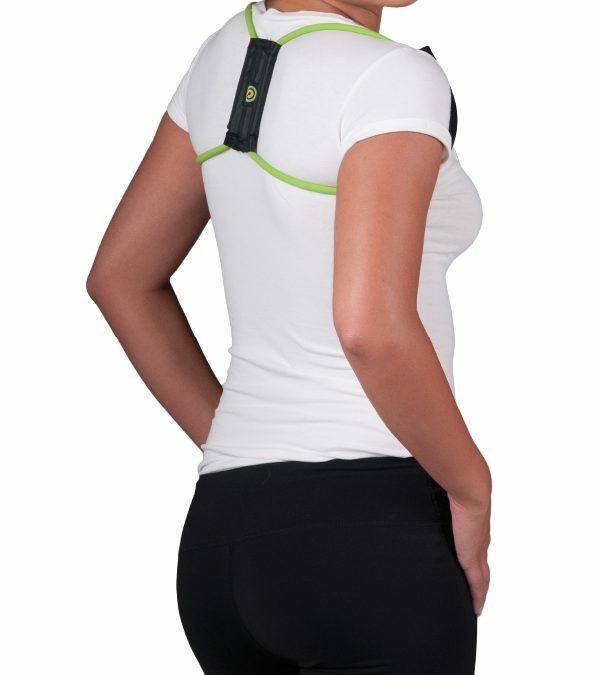 Hayley wore the Posture Medic for a total of three hours every day. She reported feeling a difference from day one and that after using the Posture Medic she could feel a significant change in her posture as well as a reduction in back pain. Not only did she feel better when wearing the Posture Medic, but also when she did not have it on, indicating that her muscles had begun strengthening to accommodate an improved posture. The exercise program, included with the Posture Medic, was used as a starting point and she then adapted the program based on her needs. It is compact, convenient and light weight, and can easily be carried in my hand bag, or even in my pocket. It can be used anywhere, at your desk, on the bus, serving customers and most importantly without having to go to a gym. It’s also not a one -size-fits-all, tailored to your height and weight you are able to select the correct Posture medic for you. Conveniently colour coded, you can select the appropriate size. After selecting the size, remember to select the resistance type of your Posture Medic. The regular strength provides less resistance and I would recommend this one for those who are currently inactive or moderate level of activity. The plus strength is great for more active individuals. The device is simple to put on and is user friendly. The Posture Medic is equipped with an exercise and stretch guide to assist you on your postural improvement endeavour. Therefore, even without prior knowledge, you are able to follow these programs, complete with exercises, repetitions and sets clearly outlined for you. More often than not, the exercises or stretches for postural corrections are postponed throughout the day. Before you know it, it is bed time and you have not managed to complete your exercise program. The Posture Medic has been a great tool, thanks to its versatility. With the convenience of one piece of equipment, I have been able to perform my strengthening and stretching exercises with ease. Due to busy schedules, allocating time to do these exercises can be difficult. No more excuses, I now catch up on my daily emails while wearing my Posture Medic. Then, as I remove the device, it’s as simple as performing an exercise or stretch before I pack it away. Being so versatile, there is a wide range of exercises and stretches that can be performed using the one tool. Examples of strength and stability exercises are isometric holds, rear deltoid fly’s, external rotation, various rotator cuff exercises, and rows. These target the smaller muscles that have weakened due to poor posture. Stretching with the Posture Medic, in my opinion, is similar to that of having a trainer assisting you. You are able to stretch the chest, lats, neck, shoulders and traps efficiently. I assumed that the Posture Medic would be very uncomfortable, having a resistance band around my arm pit. However, I was pleasantly surprised that the “handles” of the Posture Medic are made of foam, alleviating any of that. Provided that you adjust the handles once you have your Posture Medic on, so that the foam is comfortably positioned to suit you. What’s more, it is easy to put on and take off, and convenient to clean/disinfect. The rubber tubing attachment is situated under the stabiliser part of the Posture medic, so the joint in the bands are not noticeable. Research revealed that a posture brace goes for roughly $50, and for the same price the Posture Medic provides you with a stretch, strength and brace tool! The high quality bands that won’t break (I tried), and the heavy duty nylon fabric used makes this product very durable. The only con that Hayley found was a bit of rubbing on the collarbone from the bands. However, she did choose to wear the Posture Medic under her clothing, meaning it was directly on the skin. I, on the other hand, only wore mine over my shirt and had no issues with any discomfort at all. Overall, this product is great. Not only is it versatile, for strengthening and lengthening of muscles, but also for pain reduction. Tight muscles and pain commonly results from poor posture during exercise and day-to-day activities. Structurally, when you are imbalanced muscles do not activate as they should. Wearing the Posture Medic allows those muscles to strengthen while bringing proprioceptive awareness to improve your posture and reduce pain.